I rescue American Eskimo Dogs. I thought there might be some folks here that were interested in sharing information on the breed. Whether you rescue or just own one...stop in and say Hey!! 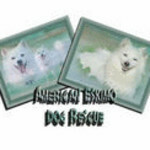 American Eskimo Dog Rescue & Sanctuary of Iowa, Inc is a 501c3 Corporation. To keep this status, NO DISCUSSION OF RELIGION OR POLITICS will be allowed on this list. I am sorry if I offend anyone, but I can not jepardize our status. American Eskimo Dog, breed of domestic dog introduced to the United States from Germany in either the late 19th century or the early 20th century. Despite The American Eskimo Dog resemblance to Inuit sled dog, the American Eskimo dog, nicknamed the Eskie dog,is a spitz type of dog, Modern families of American Eskimo Dogs can be traced to the American Eskimo Dog of the late Stone Age (about 6000 years ago). American Eskimo dogs are intelligent, energetic dogs that typically have bright white coats. The standard American Eskimo dog weighs 18 to 35 lb and has a shoulder height of 15 to 19 inch. American Eskimo Dogs belonging to a miniature variety of this breed weigh 10 to 20 lb and are 11 to 14 inch tall. American Eskimo Dogs of the toy-dog variety, which is even smaller than the miniature variety, has been developed, but the Toy American Eskimo Dog is not recognized as a distinct breed by the American Kennel Club. American Eskimo dog s have wedge-shaped skulls with wide muzzles; oval, dark brown eyes; and triangular, erect ears that are rounded at the top. The American Eskimo dog has a thick double coats that are either pure white or cream colored. The American Eskimo dog s coats are thickest around the neck, where they form a mane like ruff, which is especially obvious on American Eskimo males. the tail is curved and is covered with long hair. American Eskimo dog s have a good-natured temperament that makes them suitable for many living situations. Because of their high energy, however, American Eskimo Dogs become noisy or destructive if they are forced to be inactive. The American Eskimo Dog is a great companion dog because of their intelligence and eagerness to please. The American Eskimo Dog is rarely used to perform work. 10 years ago (14 replies) | Hot! 10 years ago (2 replies) | Hot! 12 years ago (26 replies) | Hot! 13 years ago (1 reply) | Hot!